To some people, this may not be shopping tips, but rather a compilation of Sephora shopping know-how. You may familiar with some of the suggestions below, but if you don't... hey, it's something new to learn. And! If you know any shopping tips from Sephora, don't forget to share it with me as well by commenting. When you're in the Beauty Pass, remember to redeem your birthday gift. Don't wait til your birthday to redeem the gift. As soon as the calendar turns 1st on your birthday month, go to the store and redeem it. It runs out fast and you don't want to be disappointed. If in the event, it still runs out of stock when you redeem it in the store, you can always redeem it online (with purchase required). #3 - When is the right time to shop at Sephora? Always, shop during your birthday month for the double points. In October, Sephora will have 20% sale for Black Card members. If you are a Black Card members, wait til the member sale to purchase expensive stuff you desire. If you're one of those who craves for Christmas limited edition, hold your beauty budget and spend it in December. The Sephora in-store and online often times don't link. This is because the Sephora online is outsourced and managed by Luxola. I have encountered many problems on my online purchase but the in-store is unable to help me. For example, if you purchase online, you are unable to return it at the store. If you receive any info online and the sales assistants aren't able to help you, don't blame them. Sephora updates their inventory every Thursday. If you have following new products, pop in the store on Thursday. And the online store stock up on Friday. The best time to shop online is during working hour from Monday to Friday. If you face difficulties, the customer service is only able to help you during their operation hour. Sephora staff enjoys 15% discount. If you are fortunate to know any friend that work in Sephora, you can "tumpang" on their staff discount. Unlike their US counterpart, the Malaysia return policy is not as attractive. You can only return the product within 14-days with original receipt provided that the product is unused, unopened and unmarked. There was once I bought wrong shade of the Estee Lauder Double Wear foundation (clearly mistake of the sales assistant that recommended me the wrong shade) and I was unable to return it because I use it once. The experience caused me RM160. Each sales assistant have 15 minutes limit to attend to one customer. Once the 15 minutes is up, they will need to attend the next customer. Do not feel unimportant or neglected if they leave you to shop on your own. They are just adhering to their own KPI. Within the 15 minutes, you can request the sales assistant to help you with a mini makeover which they call it Flash Makeover. For Complimentary Custom Makeover, you need to spend a minimum of RM250 (White Card)/ RM220 (Black Card) for a full makeover. Booking is required. Another bonus... If you're a traveler, Sephora has different products in different country. Do check out the Sephora if you're traveling overseas. There are some special brands or products that you can't get back home. For example, Sephora Champ Elysse in Paris has Laduree and Sephora Burj Khalifa in Dubai has Huda Beauty. You won't get it in our local Sephora. 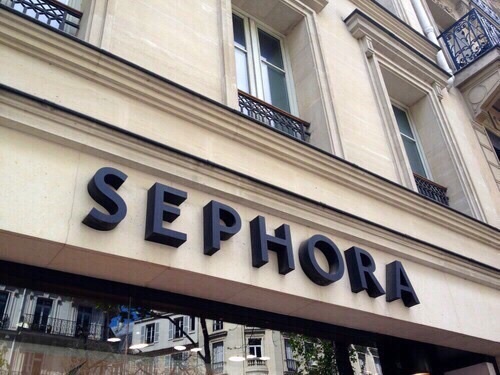 If you're new to Sephora, check out the Top 10 Products to try in Sephora. There you go... All the tips I have in hand for your shopping pleasure at Sephora. If you have any additional tips, please share with me. I would love to learn more too... Or did I miss out something that I should? Do feel free to comment.